The rare septate hyphae morphology from both lesions and culture of Pythium insidiosum is so similar to those of the molds Mucorales and Entomophthorales that it’s easy to misdiagnose. Early diagnosis of pythiosis is crucial: this infection has a high mortality rate, especially the vascular type; and a corneal transplant or penetrating keratoplasty may be needed for the keratitis type. Several case reports indicate that early diagnosis leads to less risk or greater survival for patients. This article details the proper steps to making an accurate laboratory diagnosis. Sample collection: The sample should be collected aseptically and placed in a sterile container. To keep the sample moist, a small amount of normal saline or sterile water, not formalin, is suggested. If the specimens need to be kept longer, a few drops of antibiotics (chloramphenicol/penicillin), should be added to prevent bacterial overgrowth. Transport: Avoid transporting the specimens on ice because some isolates are sensitive to low temperatures. Direct examination: KOH preparation with 10% KOH solution allows simple and rapid detection in scraping, tissue biopsy and occlusion samples. This simple test can show whether hyphae are present in the clinical specimens or not. The solution of 10% KOH with calcofluor is also recommended. 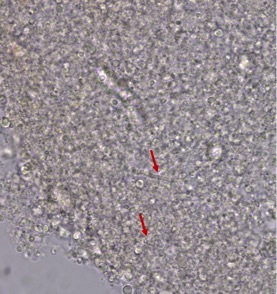 A positive sample shows rare septate hyphae with several vesicles inside (see Figure). The diameter of the hyphae is about 2.6-6.4 μ, similar to that of Aspergillus but not Zygomycetes. Culturing: The clinical specimens should be cut into very small pieces in sterile conditions before inoculation on Sabouraud dextrose agar or Sabouraud dextrose broth and incubated at 25°C-35°C. The growth of small hair-like projections of P. insidiosum around the inoculated sample is detected within 12-24 hours. When the culture is mature, it becomes a hyaline, submerged colony. Blood agar is another recommended medium for first isolation. P. insidiosum does not produce any spores on medium. Identification: Two screening methods are induction of zoospores, the natural form of oomycetes, and biochemical assay. Both P. insidiosum and Lagenidium produce sterile rare septate hyphae and hydrolyze maltose, but only P. insidiosum utilizes sucrose. A sucrose-positive result can also differentiate Pythium spp. from Entomophthoromycota and Mucoromycota. Presently, the definitive identification is via molecular approach using polymerase chain reaction (PCR), which is discussed further in “MOLECULAR DIAGNOSIS”. Physicians often send to the lab formalin-fixed, paraffin-embedded (FFPE) samples. Short, longitudinal, rare septate hyphae and transverse hyphae with a diameter similar to that of the septate hyphae would be seen. Hematoxylin and eosin (H&E) and periodic acid-Schiff (PAS) stains show necrotic eosinophilic granulomas around the hyphae, similar to the tissue reaction of Entomophthoromycota infection. Gomori methenamine silver (GMS) is the preferred stain for P. insidiosum, with the sizes mentioned above. Immunodiffusion test to detect antibodies against P. insidiosum is specific but has low sensitivity. Several other tests focusing on antibodies have been developed, such as enzyme-linked immunosorbent assay (ELISA), immunochromatography, hemagglutination and Western blot assays. Detection of antibodies is an important test for vascular pythiosis to aid management and to determine whether the patient was infected with fungus or not. Immunofluorescence or immunoperoxidase staining are also used. Molecular techniques have been used for the identification of P. insidiosum from cultures, clinical specimens and FFPE samples. The target site in the internal transcribed spacer (ITS) in the ribosomal RNA region of P. insidiosum has been used for amplification by PCR. In addition, specific primers in the cytochrome oxidase gene (COX2) have been reported to identify the species. To differentiate P. insidiosum and subcutaneous zygomycosis and entomophthoromycosis, thermophilic helicase-dependent DNA amplification (tHDA) and restriction fragment length polymorphism (RFLP) in the COX2 region could be used. Gaastra W, et al. Vet Microbiol 2010;146:1-16. Kammarnjesadakul P, et al. Med Mycol 2011;49:289-295. Vilela R, et al. J Med Microbiol 2015;64:862-868. Worasilchai N, et al. Med Mycol 2017, in press.